Editor’s Note: In the coming weeks leading up to graduation, we will highlight Park City High seniors and their outstanding accomplishments. Ian Wagman’s passion for music has propelled him to statewide competitions and opportunities many high school seniors will never experience. Wagman, who will graduate from Park City High in June, knows the value of an arts education and has immersed himself in the music programs at the high school. He plays the piano, oboe, and English horn with the PCHS Wind Ensemble, and keyboard with the Varsity Jazz Ensemble. 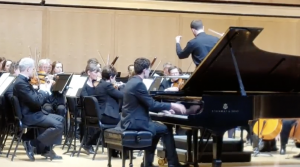 Last summer the University of Utah had a piano concerto and solo performance competition. Wagman won first place in the concerto division among high school seniors and college freshmen. In January, Wagman performed “Piano Concerto No. 1 in D-Flat, Op. 10” by Prokofiev with the Salt Lake Symphony conducted by Matthew Mainella at Libby Hall on the University of Utah Campus. You can view his performance here. Wagman’s accomplishments are many. This past summer he was one of the two drum majors of the Marching Band. This was especially unusual because both drum majors were oboists. In addition to performing at the high school, he also takes piano lessons from a professor at the U and oboe lessons from the principal oboist of the Utah Symphony. He will be attending the University of Utah where he plans to study classical composition, conducting, piano, and oboe. After he completes his bachelor’s degree, he plans to attend a conservatory to get his master’s and doctorate degrees.